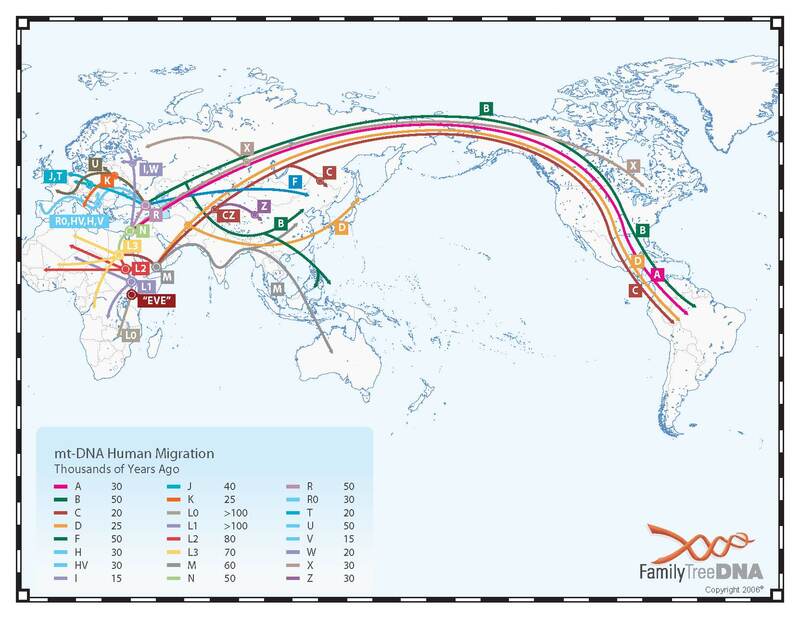 The 2009 Y-DNA Human Migration Map prepared by Family Tree DNA shows where all haplogroups originated and how they spread. The haplogroups distribution of members of the Armenian DNA Project (R1b, J2, J1, G, E, I1, I2, T, R2, Q, F, R1a, L, A) can be viewed on the "Results" page. The relationship between these broad haplogroups can be seen in this TREE (ISOGG) and this TREE (1000 genomes). The relative age of the specifically European and Asian Y-DNA haplogroups can be seen in this TREE taken from a recent paper in Current Biology by Pedro Soares et al. This Armenian version of the same tree gives you an idea of the size and diversity of the male Y-DNA haplogroups in the Armenian population. 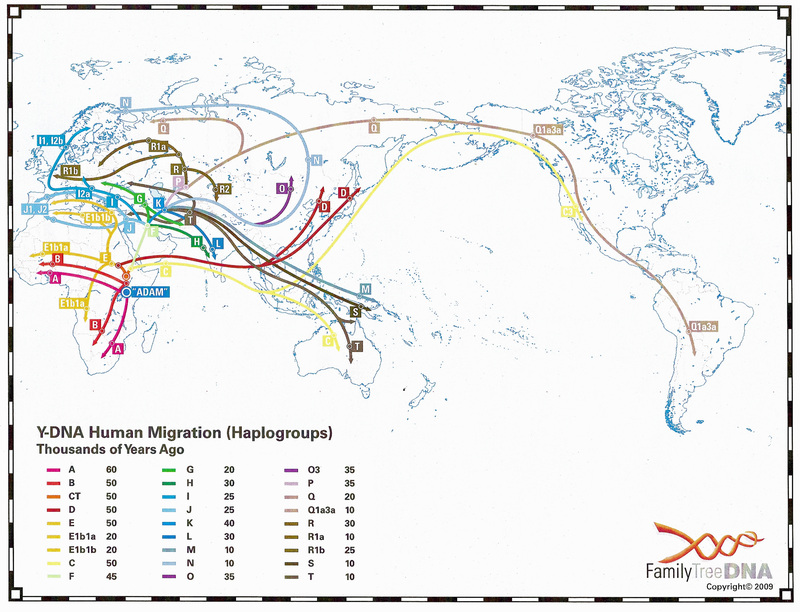 The 2006 mtDNA Human Migration Map prepared by Family Tree DNA shows where all haplogroups originated and how they spread. This TREE gives an idea of the overall branch structure. The haplogroups distribution of members of the Armenian DNA Project (H, U, T, I, W, HV, J, K, X, N, V, F) can be viewed on the "Results" page. The relative age of the specifically European and West Asian mtDNA haplogroups can be seen in this TREE taken from a recent paper in Current Biology by Pedro Soares et al. 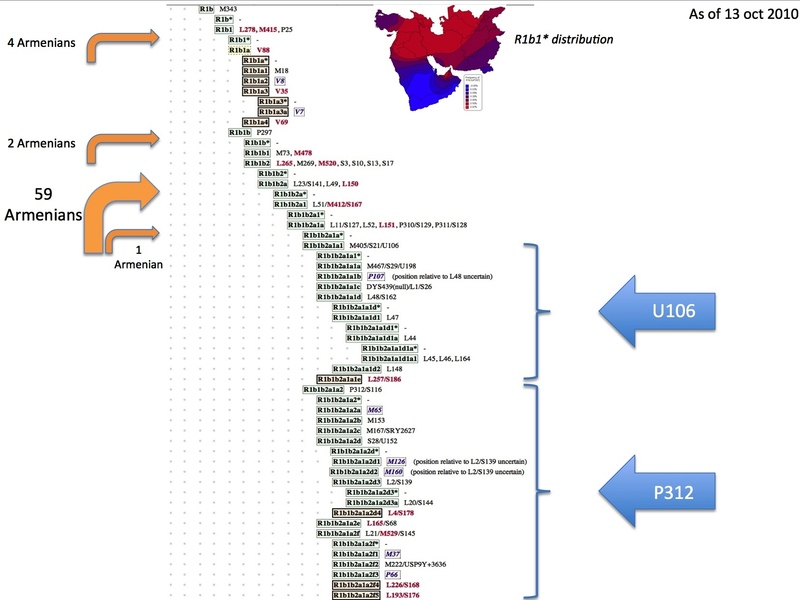 This Armenian version of the same tree gives you an idea of the size and diversity of the maternal mtDNA haplogroups in the Armenian population. The African Origin model for all modern humans is well represented in this TREE taken from a recent paper in Current Biology by Michael C. Campbell and Sarah A. Tishkoff. For more on this subject. See next section further down this web page. All members of the Armenian DNA Project should visit the website of the International Society of Genetic Genealogy to view the latest version of the ISOGG 2013 Y-DNA Haplogroup Tree. By clicking on their haplogroup letter, they can view the most recent information concerning their branch of the tree (clades, sub-clades, etc. with associated SNP mutations). SNPs are permanent DNA mutations that are passed on to all males in the direct line of male descent. They are used to determine branches within haplogroups. 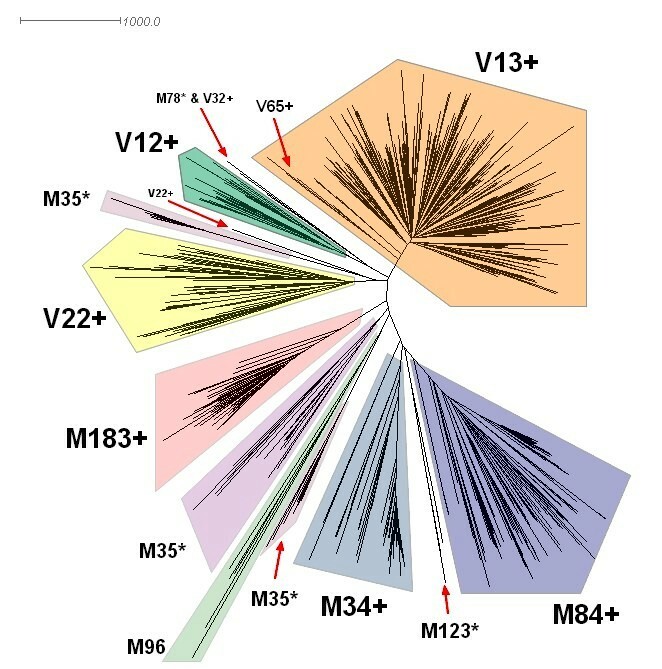 Newer but much more technical Y-DNA trees for some haplogrougs can be found at the DNA-Fingerprint website run by Thomas Krahn, head of FTDNA's Genomics Research Center. Thomas Krahn has also provided a link to the most up-to-date (and technical) tree available in DRAFT form here. 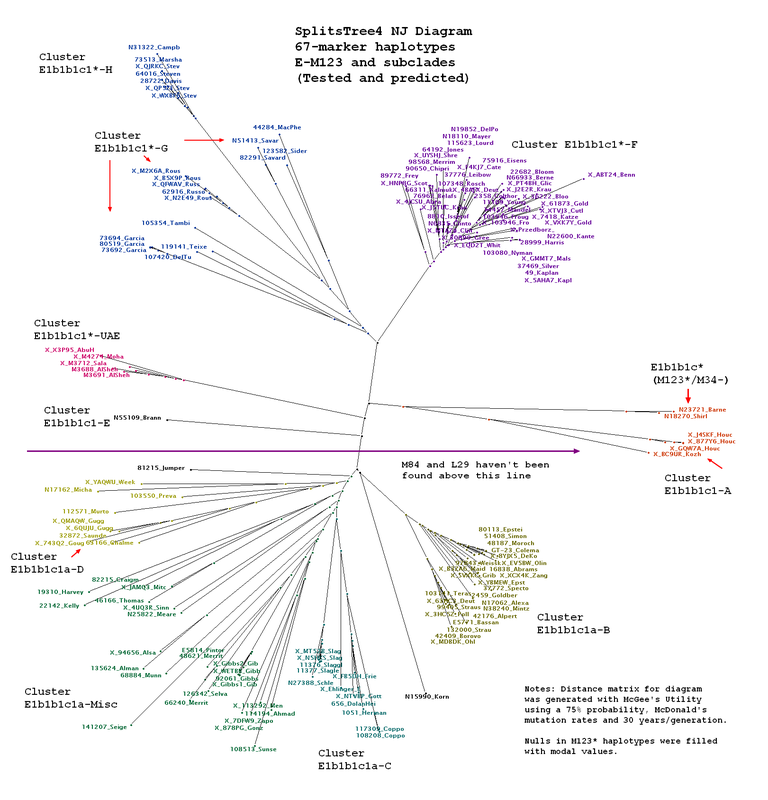 The links from this tree to the Y chromosome map are only of interest to geneticists. Family Tree DNA has another way of presenting the trees for Y-DNA in this now dated file from 2009 (big file). In case you come across "old" papers using now dated nomenclature, this TREE from 2002 should come in handy (Ref. YCC NRY Tree 2002 v2002.01.18 from the Y Chromosome Consortium at the University of Arizona). 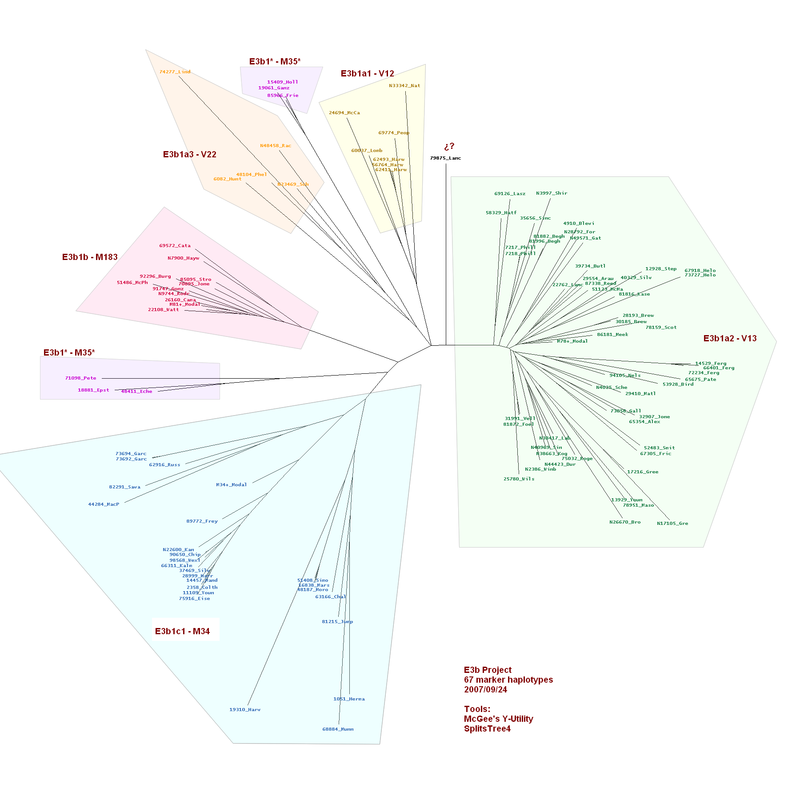 Argus Biosciences has prepared a detailed Phylogenetic Tree of mitochondrial DNA and a MAP showing the distribution of mtDNA haplogroups by region on a global scale. Please zoom in for better views. The views discussed in this section are those of Dienekes Pontikos as per his analysis of a recent paper by Michael GB Blum and Mattias Jakobsson: "Deep Divergences of Human Gene Trees and Models of Human Origins." There are four or five scenarios to explain the current distribution of human populations as can be seen in this figure. The Recent out of Africa: Single Origin Population model is the simple model that has found support in the shallow coalescence times of human Y-chromosomes and mtDNA and has made the jump to popular culture. In this model, humans are a young species that underwent a bottleneck, and Eurasians are descended from a group of Africans that left the continent. This model has been criticized for its perceived inability to explain deep divergence times in autosomal DNA. In this model, the African "Eve" lived 170,000 years ago while the African "Adam" lived 100,000 years ago. The Recent out of Africa: Multiple Archaic Populations model advocated by Dienekes Pontikos over the years agrees with the previous model in the recent African origin of modern Homo sapiens but it states that the African population was structured and not panmictic: divided into fairly isolated long-standing subpopulations, and that Eurasians are descended from a single one of these African subpopulations (termed "Afrasians"). The existence of a structured African population makes easy work of deep divergence times, as the variants that have such deep origins are presumed to have evolved separately in different African subpopulations, and then to have found themselves in the modern gene pool after the breakdown of this structure. The Multi-Regional: Recent Admixture model is the one advocated by those seeing Neandertal and/or Homo erectus introgression in Eurasia. Like the previous two models, it agrees on the recent African origin of modern humans, but it sees a place for long isolated pre-existing Eurasian hominids, who contributed some of their mtDNA to modern humans. Like the previous model, deep divergence times are no problem, as two variants with deep common ancestry are presumed to stem from the separated Eurasian and African Homo. This model has found recent support by analysis of the Neandertal genome but as the authors of that study and myself have stressed, the evidence for 1-4% Neandertal introgression into Eurasians has an alternative explanation consistent with the previous (Multiple Archaic Populations in Africa) model. Finally, the Multi-Regional: Long Standing Admixture model sees no special place for Africa, except as the point of origin of human Y chromosomes and mtDNA. Humans are descended from Homo populations from around the world that have always maintained gene flow between them. 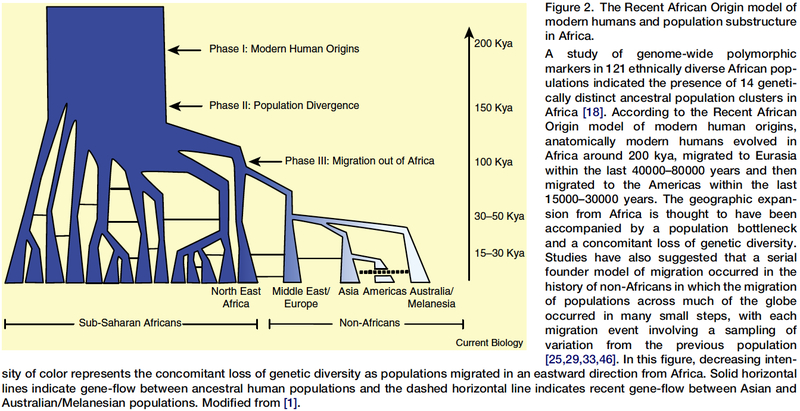 This model obviously explains deep divergence times, but has a difficult time explaining the African origin of the uniparental markers, the palaeoanthropological evidence for an emergence of anatomical modernity in East Africa and the genetic evidence for a diminution of genetic variation in Eurasia with increasing distance from East Africa. Blum and Jakobsson seem to propose a fifth Ancestral Bottleneck model which is noted as a bottleneck 150,000 years ago in a possibly ancestral structured population. This model doesn't get its own figure, but can be seen in the Single Origin Population model as "Potential bottleneck 150,000 years ago". This model seems to combine elements of the first two ones: it is an essentially single origin model for extant humans, but it keeps the possibility of structure in Africa prior to the bottleneck, and pushes the breakdown of this structure before the bottleneck. Various academic geneticists and genetic genealogists are doing interesting work with AUTOSOMAL DNA. Here are the results of comparisons between Armenians and neighbouring populations from Behar, the Dienekes Blog, the Dodecad Ancestry Project and the Eurogenes Bio-Geographic Ancestry Project. To dig deeper: (1) Doron Behar's paper, (2) Dienekes, (3) Dodecad & (4) Eurogenes. 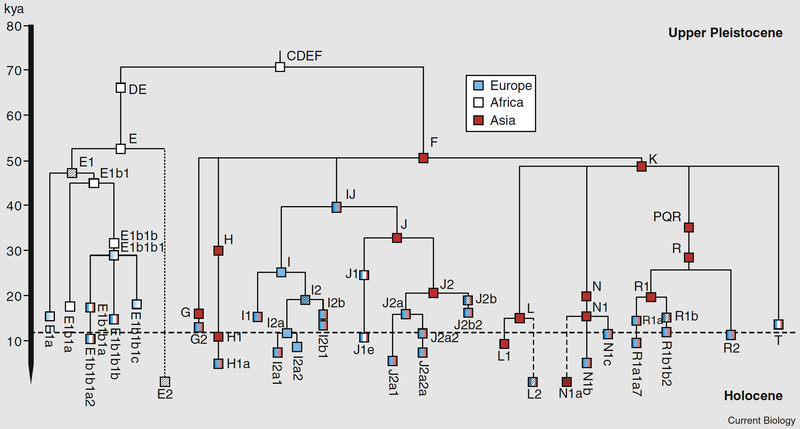 This diagram shows how little East Asian DNA is found in Turkish autosomal DNA. For more on this subject look at this blog discussion, this 2011 post and this 2012 post . Look also at the abstract of an upcoming paper by Inci Togan. R1b1a2a represents the largest haplogroup for Armenians in general and project members in particular. It has been estimated to be 8,000 years old. According to Vince Vizachero who runs the haplogroup R-ht35 Project: "From prior analysis, it appears that R1b1a2a moved north and west into Europe quite rapidly. And the data we are seeing in our project are consistent with that: the oldest forms of R1b1a2a are found at high frequency in the "homeland" of SW Asia and places with the most contact with that region. The closer we get to NW Europe, the more we observe the youngest, derived forms of R1b1a2a." The current distribution of this haplogroup shows a heavy concentration in Western Europe (from the Northern part of the Iberian peninsula to Ireland and England via France and Belgium) as can be seen in this MAP. The map corroborates Vince's conclusions as it shows a 15% concentration of R1b1a2a in a Northern swath of Anatolia - with a peak of 25% in the middle of the swath. The studies on which the map makers drew sampled broadly in the region including Turks, Kurds, Georgians and Azeris. If you sample only Armenians, you get a concentration of 30% of R1b1a2. If you sample only Armenians from Karabakh and Syunik you get concentrations of more than 40%. The distribution of the "youngest and derived forms" of R1b1a2 found mainly in Western Europe - which include any Armenians so far - can be viewed here (the numbers represent percentages). Both are the only known branches of R1b1a2a1a1 (ht-15): P312 = R1b1a2a1a1a and U106 = R1b1a2a1a1b. If any Armenians are found in one of these two groups in the future, it will most likely mean they are descended from Crusaders. As per Wikipedia: It was initially believed that R1b originated in western Europe where (considered as a whole, including subclades) it reaches its highest frequencies. However R1b's variance increases as one moves east, leading to the view that R1b originated further east, and (M269) expanded into Europe in the Neolithic not Paleolithic. Many geneticists now believe that R1b arose in Central Asia or Western Asia. All of the above is illustrated quite clearly in this PowerPoint slide. This lengthy article on R1b1 is fairly accurate and up-to-date. Recommended reading for members of this haplogroup. A warning however concerning the articles on the other haplogroups: there are numerous inaccuracies and ommissions. Vince Vizachero prepared the following MAP of the distribution of R1b1a2* (yellow - L265+), R1b1a2a* (green - L23+), R1b1a2a1a* (orange - L51+), and R1b1a2a1a1* (red - L11+). The vast majority of R1b1a2 members of the Armenian DNA Project belong to the green R1b1a2a* L23+ branch. A few are part of the yellow R1b1a2* L265+ branch. None are orange R1b1a2a11* L51+ only. One is red R1b1a2a1a1* L11+. More importantly, no Armenians are found in the big European branches downstream of red L11+, namely U106 & P312. A recent study published in january 2010 seems to corroborate all of the above. According to its authors (Balaresque et al): "Haplogroup R1b1a2 is the commonest European Y-chromosomal lineage, increasing in frequency from east to west, and carried by 110 million European men. Previous studies suggested a Paleolithic origin, but here we show that the geographical distribution of its microsatellite diversity is best explained by spread from a single source in the Near East via Anatolia during the Neolithic... R1b1a2 was carried as a rapidly expanding lineage from the Near East via Anatolia to the western fringe of Europe during the Neolithic. Our interpretation of the history of hg R1b1a2 now makes Europe a prime example of how expansion of a Y-chromosomal lineage tends to accompany technological and cultural change." Unfortunately, the authors did not type R1b1a2 subgroups. 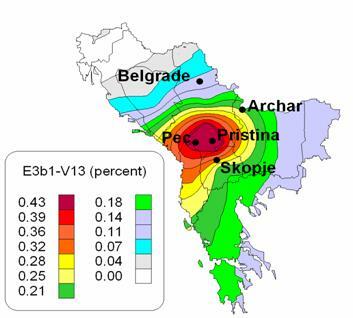 Since their study makes raw use of the genealogical rate of mutation and does not sufficiently cover Balkan samples, their conclusions are somewhat oversimplified. Another study published in august 2010 (Myres et al.) strengthens this view: "The phylogenetic relationships of numerous branches within the core Y-chromosome haplogroup R-M207 support a West Asian origin of haplogroup R1b, its initial differentiation there followed by a rapid spread of one of its sub-clades carrying the M269 mutation to Europe." January 2011 update: there now seems to be some structure to the largest haplogroup branch in the Armenian DNA Project. Armenians and others getting tested at 23andMe seem to belong either to one of the two new L277 and L405 subclades or to neither of them. Large scale testing will begin once these SNP mutations are available for testing at Family Tree DNA. Ref. this clear new TREE prepared by Vince Vizachero. If all of the above is true, it may explain the origin of the Basques. For the latest research on the less differentiated but not necessarily more ancient R1b1* haplogroup branch, visit the news page of Vincent Vizachero's R1b1* DNA Project. Vizachero computed branch lengths for R1 and came up with the following estimates: R1 = 18,500 years ago; R1b1 = 15,300 years ago; and R1b1a = 12,500 years ago. Here is the summary TREE for R1b1 and its major branches. Vizachero notes that R1b1* exists throughout Eurasia. It is pretty rare in Europe, and there is no getting around the fact that R1b1 is essentially a Eurasian haplogroup with strong phylogenetic structure. As per this MAP, R1b1* has its frequency peak in SW Asia - it appears to have more diversity there too. As per Vince: "There are two main branches in R1b1 (R1b* is probably a phantom). One branch is R-P297 [R1b1b] and the other branch is what we call R1b1* (or R1b1(xP297). So if you are looking for an origin point for R1b1, then you look for the intersection of those two sets. The TMRCA for those two lines is roughly 16,000 years ago. R-P297 is easy, since there are only two clades which are easily identified by SNP. R1b1a1 and R1b1a2 both have Eurasian distributions, and the origin point for both is in the Near East (call it Anatolia+Levant if you want). The TMRCA of R-P297 is roughly 12,000 years ago. Although the frequency of R-M73 [R1b1a1] is highest in Central Asia, this is not where it is most diverse. And there are three distinct clades of R-M73. R1b1* is itself divided into two major lineages, with the split between them being roughly 15,000 years ago. The academics never pay enough attention to R1b1*, but we can see that the frequency peak of R1b1* is clearly in the Near East." The first cluster of R1b1* (call it A) is comprised solely of Europeans, Sephardic Jews and an Armenian. The second cluster of R1b1* has two subgroups (call them B1 and B2). B1 is composed of an Armenian, an Iraqi Syriac & an Iranian Arab. "B2 is comprised of a wide group of people (including Europeans, Arabians, Ashkenazi, Africans, etc). It is this group B2 which appears to have been the source population for the back-to-Africa migration to Cameroon." Cluster B1 diverged from cluster B2 about 10,000 years ago. A new SNP mutation called V88 separates both A and B1 from B2. Vince Vizachero believes " that R1b1 first appeared in the northern part of southwest Asia (e.g. Iraq/Iran) while V88 first arose in an R1b1 population living just a little further south (e.g. the Levant or Arabia)." Members of haplogroups G2a & G1 can learn about the various G clades at: Haplogroup G Categories, Samples, Diagrams, Etc. They can also learn about Haplogroup G Time Relationships and Migration Patterns. You can dig deeper by looking at the comprehensive categorization of G samples along with some diagrams. These sites were created by G DNA Project administrator, Ray Banks who keeps up-to-date Wikipedia pages for: G, G1, G2a1, G2a3a and G2a3b1. The haplogroup G mutation developed about 21,000 to 14,000 years ago. Whatever the date or specific place of origin, part of the G family put down roots predominantly in the area south and east of the Caucasus mountains. The Caucasus are today mainly the countries of Georgia, Armenia, Azerbaijan and southwestern Russia. The region of origin for the major G groups of today was most likely somewhere in Turkey, the Caucasus mountains region, Iran or the eastern Mediterranean - all places where G is found both in significant numbers and with the diversity expected with a long presence. According to Ray Banks, administrator of the G Project at FTDNA; "G2a3a is found in significant numbers in Turkey, Greece and the eastern Mediterranean countries. G2a3a persons seems to spread wesward mostly along the Mediterranean from these regions. Very preliminary calculations suggest the M406 mutation that characterizes G2a3a arose about the year 2100 B.C.E. as a very general estimate. Detailed samples available from inland Europe were compared with detailed samples from more easterly sites, namely (1) Turkey (2) Lebanon-Jordan and (3) Armenia. These comparisons show that most Europeans have Armenians as their nearest relatives with separations from them starting generally about 1300 B.C.E. and extending into the Dark Ages period after the Roman Empire. Those with the oldest separations (generally abt 1300 B.C.E. to 800 B.C.E.) show splits with the entire group in the east -- equally -- rather than with a specific region. This is to be expected since the age of the mutation probably does not extend much further back." Some researchers believe the G2a3a1 branch possibly originated a few thousand years ago in the Hurrian / Urartian population of the Armenian Plateau. The origins of G1 seem to be Iran. However, since so few G1's have been thoroughly tested, we cannot as yet draw any firm conclusions. Prof. Levon Yepiskoposyan has found a high concentration of G1 haplotypes in the Armenian-speaking Hamshen population of Abkhazia (originally from Ordu and, ancestrally, from the mountains above Trabzon/Trebizond and Rize). Haplogroup G seems to have expanded from southwestern Asia or the Middle East to Europe west of the Black Sea and to the western Mediterranean and central Asia primarily about 1,700 to 3,000 years ago. The three countries of Georgia, Armenia and Azerbaijan provide STR samples consistent with all types of haplogroup G seen today in Europe west of the Black Sea with the exception of G1 and G2c. Because of the rich diversity of these G types, this area of the world is a leading candidate for the starting point for most G migrations especially those to western and central Europe. This MAP shows the current geographic distribution of haplogroups J1 & J2. A new MAP of J2a (M410+) was published in December 2010. Armenian members of these haplogroups currently belong to the following branches: J1*, J1c3d, J1c3d1, J2a*, J2a3, J2a4, J2a4a, J2a4b, J2a4b1, J2a4d, J2a4h2, J2a4h2a, J2a4h2f, J2a4h2g, J2b* and J2b1. Here is the latest on the draft branch structure of J1 & J2 . This is the latest tree for J1. Members of the J1 and J2a4* haplogroup clades can view the latest Fluxus diagrams created by J DNA Project administrator Bonnie Schrack on this Y-Haplogroup J DNA Project page. They show how the different branches and clusters within each group relate to each other. The "J1* with DYS388 = 13 or 14, L136-, P58- sub-clade" is considered by Dr. Roy King of Stanford University to be one of the markers of the Caucasian-speaking Hurrians and Urartians. James Honeychuck has prepared a MAP of the current distribution of this sub-clade. Many if not most of the Eastern European cases of J1* with DYS388 = 13 or 14 shown on this map could well be ancestrally Armenian. While J1e (now called J1c3d) is predominantly Arab & Jewish, this branch of haplogroup J1 is more ancient than these two groups. It also contains other Near Eastern, Anatolian and Caucasus Mountain ethnic groups. Quoting Jacques Chiaroni, Roy King et al. : "The highest YSTR variance of J1e lineages is in eastern Anatolia, northern Iraq and northwest Iran... The somewhat rare J1e1-M368 provides an insight into the geographical origin of J1e. It has been reported both in the Black Sea region of Turkey and Dagestan in the northeast Caucasus. Furthermore, J1e1-M368 displays the YCAII 19-22 pattern. 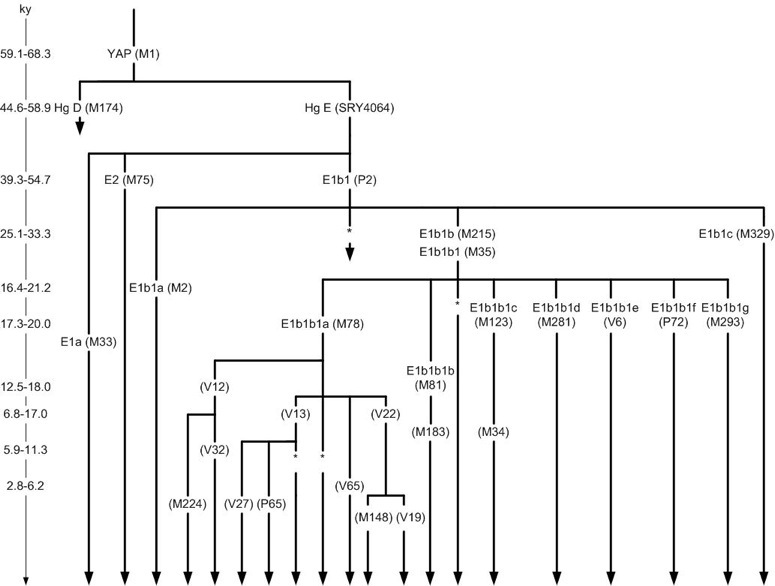 Although the haplogroup relationships of YCAII alleles are unstable, nevertheless in the context of haplogroup J1, they are suggestive that the prevalent YCAII 22-22 variety may have evolved from a YCAII 19-22 ancestor. The current data suggest an origin of J1e in the general area of eastern Turkey/northern Iraq associated with the Zarzian horizon, as they have similar early pre-agricultural expansions [16,000 years ago]... The timing and geographical distribution of J1e is representative of a demic expansion of agriculturalists and herder–hunters from the Pre-Pottery Neolithic B to the late Neolithic era... J1e results provide an example of a southward spread [from the Fertile Crescent into the Arabian Peninsula] during the early Holocene." According to Dr. Roy J. King, J2a4a (M47+) "may turn out to be important in the broader region--East Anatolia, Iraq, Western Iran, so the fact [it was] discovered in the Armenian population is quite interesting. We don't see it in Greece, Crete or particularly in Western Europe, but M47 has low YSTR diversity, unlike M67 [J1], and it may be somewhat younger--Bronze Age in its expansion time." Members of the J2a4h (L25) branch belong to two distinct clusters. The older one is characterized by a value of 10 at DYS445, the younger one with a value of 6. According to David Dugas: "We are currently thinking that 445=10 is the ancestral state for this subclade and its origin might be Iraq or the region where Turkey, Iran and Iraq meet. 445=6, a downstream cluster, partly defined by L70 arose in a levantine or coastal anatolian region from a 445=10 haplotype." This is what Al Aburto has to say about the younger branch: "It is not exactly clear where and when the first person, already having L25, had the first DYS445=6 deletion from the DYS445=10 state (DYS445=10 is most common in the rest of the L25 people). It was probably in Southern Turkey, Northern Syria, or Lebanon --- somewhere in that area that it occurred. The time frame is not clear either but from a program I use (Generations5) the L25(xL70) with DYS445=6 cluster seems to be about 3,600+/-400 years old. This MAP shows where L25*(6) haplotypes have been found so far. Data from the Middle East (which would make the origins clearer) is slowly building up." This data has recently enable the administrators of the project to prepare this MAP of variance. Members of one of the oldest haplogroups, E1b1b1, can view the route through which it spread out of Africa as well as the estimated relative age of the various subclades. Here is the latest TREE of the E1b1b1 branch... and here is a DIAGRAM for an alternate view. The DE haplogroup appeared approximately 50,000 years ago in north east Africa and subsequently split into haplogroup E that spread to Europe and Africa and haplogroup D that rapidly spread along the coastline of India and Asia to North Asia. 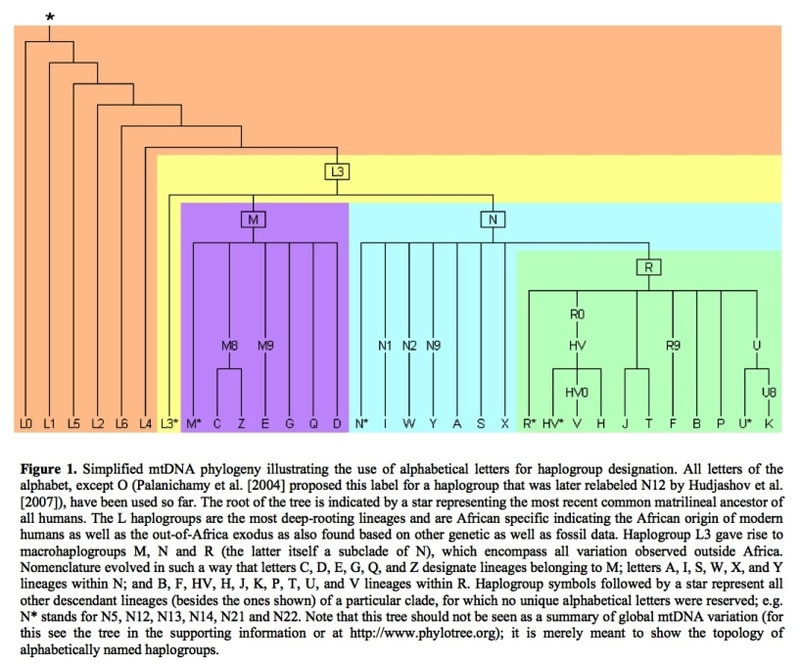 Haplogroup E would appear to have arisen in Northeast Africa based on the concentration and variety of E subclades in that area today. But the fact that Haplogroup E is closely linked with Haplogroup D, which is not found in Africa, leaves open the possibility that E first arose in the Near or Middle East and was subsequently carried into Africa by a back migration. Armenian project members belong so far to the V12, V13, V22 and M84/M34. The relationship between these three large subclades of E1b1b1 = M35 can be seen in this M215+ Diagram. E1b1b1 = M35 is thought to have arisen 25,000 years ago. , known currently as E1b1b1c1, originated in Anatolia. From there it spread West into Europe and South into the Middle East and Africa. The clusters within its branch appear as in this M84+ Diagram. M34/M84 shows its highest frequency and haplotype diversity in regions of the Fertile Crescent, decreasing toward the Arabian Peninsula. The story with , currently known as E1b1b1a2, is complicated. Did it originate in the balkans or in the Near East? Dr. Roy King believes V13 is one of the genetic signatures of the invading Indo-European speaking Armens who came through the Balkans into Anatolia. Take a look at this MAP which, in my opinion, is somewhat incomplete. This article on V13 by Steven Bird is a must read. Some Y-DNA lineages could have been introduced in the same way into the Armenian population by Roman auxiliary legionnaires from the Southern Balkans . V13 exhibits a strong star-like rapid demographic expansion from a single founder. The outlines of new branches are starting to emerge... but the structure remains unclear as does the place of Armenian V13s in it. The latest thinking on V13 is that it originated somewhere between the Northern Levant and the Armenian Plateau. , known currently as E1b1b1a3, could have started in Northern Africa in the green Sahara region during a period known as the Holocene Wet Phase which started in 7,000 BC and lasted until about 3,000 BC. As the theory goes, when that area turned into desert, there were two routes of migration. One east to Egypt and the Levant and the other towards Morocco and Iberia. The flash point for the expansion V22 seems to have been the Near East or Anatolia around 2,300 BC. , known currently as E1b1b1a1, may have been introduced at the time of the Egyptian conquest of the Near East by Ramses the Great followed by the rapprochement between the 19th Egyptian Dynasty and the Hittite Empire. According to Kerry O'Dair, administrator of the V12 Project: "We have multiple branches extending from the modal. However the longest branch, which represents the greatest length in time, has its first relationship downstream from Egypt in Central Anatolia. This strongly suggests that the earliest departure from Egypt ended up in Central Anatolia based on what this data is telling us. This would seem to be consistent with historical records and archaeology." Haplogroups I1 & I2 are descendants of suprahaplogroup F which is thought to represent a second and later stage of human migration out of Africa 50 thousand years ago. As can be seen in this MAP, Haplogroup I and its sister clades J1 & J2 are thought to have reached Europe via the Middle East using the Levant corridor which is part of the ancient fertile crescent created by the river systems of the Tigris, Euphrates and Nile Rivers. It is worth noting that haplogroup J is present in and highly typical of the Middle East, while haplogroup I is nearly non-existent here and seemingly exclusive to Europe as can be seen in this MAP (M253 = I1; M26 = I2a1; M423 = I2a2; M223 & M284= I2b1). As per Ken Nordtvedt, the haplogroup I specialist: "Straddling 12,000 years B.P. [Before Present], Europe and nearby regions experienced a prolonged cold period of over a thousand years duration --- the Younger Dryas. It was probably the most recent severe demographic setback our ancestors around Europe experienced. Although y haplogroup I (y-Hg I) was by then a mature-in-age haplogroup, being perhaps 10,000 years old already, I conclude from collecting and examining between five and ten thousand haplotypes of y-Hg I today that only nine males emerged from Younger Dryas with surviving male-line descendants today. These Younger Dryas Nine now have tens of millions of male descendants in Europe and elsewhere on the globe where Europeans have settled in recent centuries. 12,000 B.P. each of these nine males were not alone; each was living in a surrounding hunter-gatherer male population of immediate family, extended family, clan, tribe, etc. Some of these neighboring males carried y haplotypes very close to one of the nine and descended from common ancestors not too much further back in time. These clades of haplotypes surrounding each of the nine could be counted in the tens, hundreds, maybe even thousands of contemporaries. But due to very high extinction probabilities for these male lines, exceeding 99 percent, these nine lucky ones emerged as sole representatives of their clades having surviving lines today. Many y-clades no doubt went completely extinct in that era". You can read Ken's entire post here . It remains to be seen how / where the Armenians members of this haplogroup fit. Initially I thought they would either be remnants of the original Anatolian population or descendants of Europeans who migrated back into the Armenian plateau. Both cases are possible. There are tantalizing hints I2* originated in the region as it has so far been found only in Armenia, Turkey and the Caucasus. According to Ken "Armenia is becoming the hotspot outside of Europe for I2*. The mist may be clearing as to just where IJ spawned I and J" and "I2* ... is the only clade or sub-haplogroup of Hg I with a likely outside-of-Europe indigenous population." Also according to Ken (edited): "An F man is certainly an ancestral node to the IJK nodeman and later IJ nodeman and later I nodeman. We have never found a single haplotype of IJK, IJ, or I*. And a very long time goes by between the IJK nodeman and the earliest clades of "I" that we see --- perhaps I2* and I2a1 M26+ clades. We're talking several tens of thousands of years. I2* certainly channels our attention toward the Caucasus. But no other clades of "I" in my book do so. So that leaves open the question of whether those early "I" guys moved west to the north of the Black Sea or to the south of it. I right now bet on the southern route, but with no strong conviction about it. The quantity of I2* Armenians and the southern European features of I2a1 M26+, not to speak of IJ being a parent to "J" as well as "I", tilt me that way." There are three clades in I2*. Each seems to have gone a separate way after the Last Glacial Maximum (10,000 years ago). As per Ken Nordtvedt: "I2* has three main clades whose ancestral lines separated 8,000 years ago or so. One of them has a strong contribution from Armenia/Anatolia and elsewhere in SW Asia. And the Greek members of this clade add to its geographical uniqueness. It also has a very young Jewish sub-clade. Also according to Ken: "The more I look at the overall clade which includes the Armenian/Turkish cluster, the more I see a clade spread by a trading family or clan across the breadth from Iberia to the Caucasus and across the Mediterranean. Where it originates is hard to determine." Ken finally adds: "... two of the clades of I2* are purely European --- and northwest and central Europe to boot, although a few Italian haplotypes are included. These latter two clades of I2* have an interclade node age estimate of 7,500 years. The Armenian/Turkish members of I2* clade B have a coalescence age of 2,300 years. When including the Jewish I2* members of the same clade, the coalescence age becomes 3,400 years. Clade A has a coalescence age of 3,600 years in Northern Europe while clade C has coalescence age of 2,200 years in Central Europe. "The three clades of I2* separated from each other very long ago compared to their separate coalescence ages. Someday we will have SNPs to separate these clades." This MAP of the current distribution of the different I2* clades is quite telling. The common ancestor of the seven Armenian I2*'s lived approximately 4,500 years ago. Here's the most recent post on this subject by Ken Nordtvedt: "The I2* cluster is an enigma because overall I2* is probably the strangest haplogroup in Hg I. I2* is generally spread across every quarter of Europe except noticeably light in Scandinavia. I2* has a strong and much older Armenian/Turkish presence and shows up elsewhere in the MidEast/Levant. Because of the bias of our good databases, however, an objective statement of its relative strength across this vast span of territory can not yet be made. But no other subhaplogroup of I is so lacking in geographical concentration. And I2* is old in the time back to its TMRCA --- only being challenged as oldest Hg I clade by I2a1 M26+ Sardinian." With regards to the I2a branch, I am more and more enclined to believe it represents one of the major genetic components of the Indo-European speaking "Armen" people, themselves part of the Phrygian people, who came into Anatolia from the West around 1,300 B.C. As per Dr. Roy King: " ... Assyrians and Armenians are practically identical [genetically] except for language which must be reflected in the I2 and perhaps E1b1b1a-V13 frequencies for the Indo-European superstratum. This is interesting in that it suggests that the Indo-European Armenian speakers came from the Balkans rather than via the Caucasus." 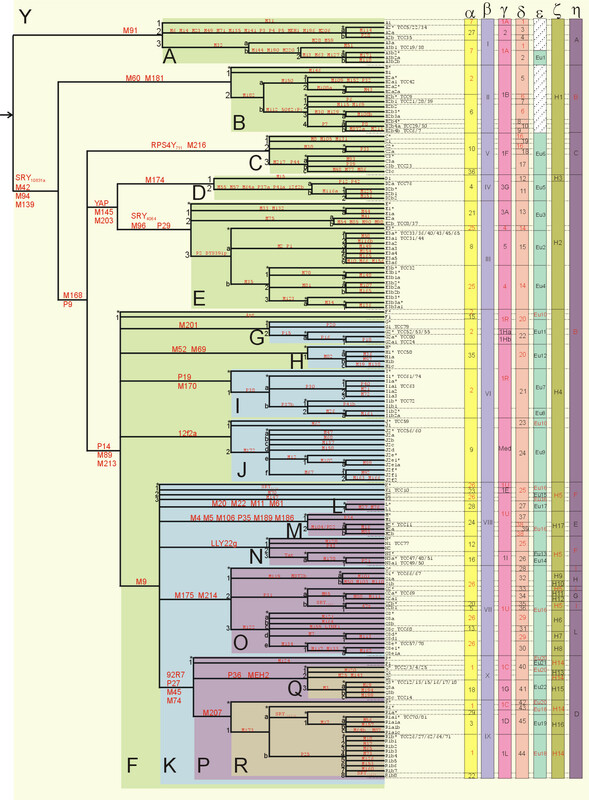 Here you can view a superb TREE of haplogroups I1 & I2 prepared by Ken Nordvedt. This May 2011 version takes into account major discoveries and a complete reclassification of the various branches. As per Ken Nordtvedt: "The approximately common separation of haplogroup I into four branches 20,000 years ago probably has some implications for our speculations of how haplogroup I spread in Europe (and Anatolia) so long ago. The I2 branch line is even more ancient now." 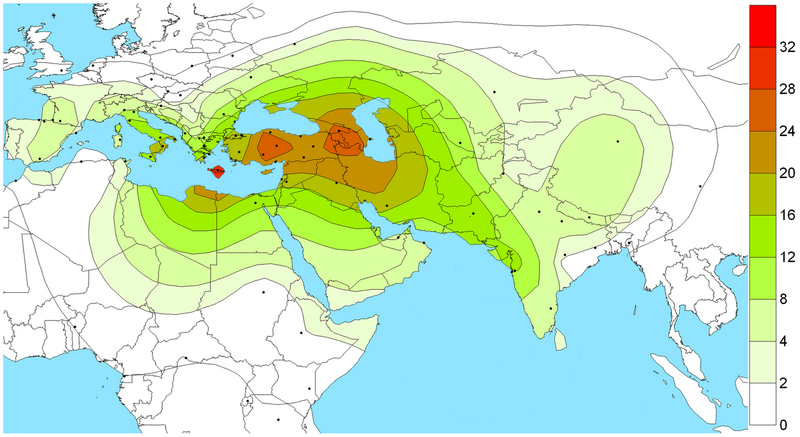 Haplogroup T, formerly know as K2, has two branches, T1a & T1b, and is found at low frequencies throughout Europe and in parts of the Middle East, North Africa, and West Africa as can be seen in this MAP. Its origins and spread are still mysterious but we are slowly getting more clarity as can be seen in this new large and relatively slow-to-load MAP. The worldwide distribution of haplogroup T is spotty with some small areas of greater-than-average concentrations. T1a has a more southerly bias from the Near East to Europe and North Africa. T1b has a more northernly bias from the Near East through the Russian plains to Northern Europe. This is the view of Gareth Henson, administrator of the Haplogroup T project at FTDNA: "I think both T and L originated in the Iraq/Iran region but whereas the branches of L all went in different directions I don't see a similar pattern for T. The main groups are T1a and T1b. Both seem to have spread out together, but T1a shows more variation." A major paper on haplogroup T published in 2011 found a number of new SNP mutations which define a number of new branches (Fernando L. Mendez et al, "Increased Resolution of Y Chromosome Haplogroup T Defines Relationships among Populations of the Near East, Europe, and Africa"). 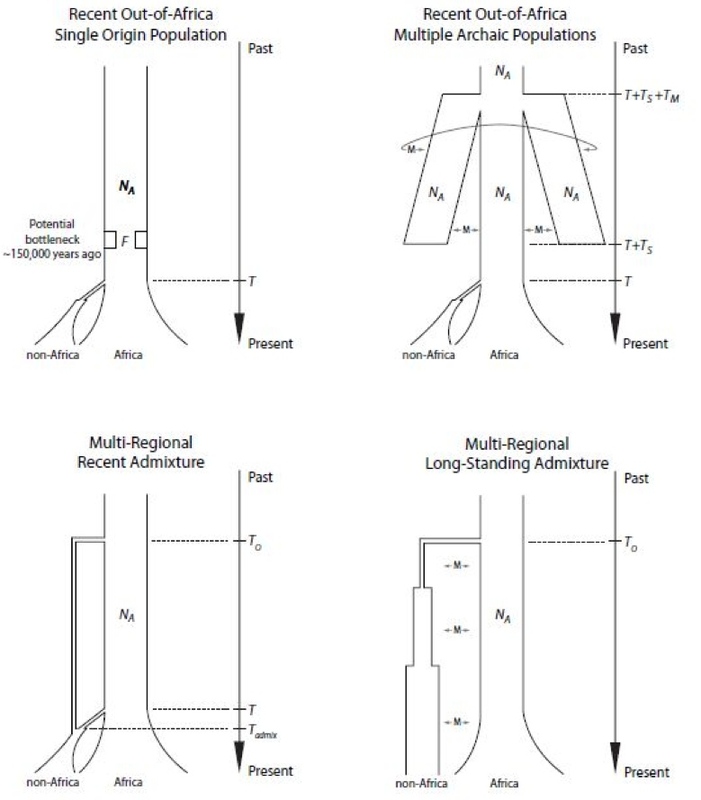 The overall structure is unchanged as the main branches remain T1a and T1b. A new link to the sister haplogroup L was discovered. Project member Jean-Grégoire Manoukian has prepared this fascinating (but dated) Synthesis of Haplogroup R2. The early results for the Armenian R2 project members with 67 marker results fit as follows in this R2 Phylogenetic Tree. According to the administrator of the Family Tree DNA R2-WTY project, "Maybe with more diverse results which confirms or expands the Anatolian Cluster, I would consider a Central Asian or Anatolian origin theory of Haplogroup R2 or (at least an ancient Anatolian cluster). Take a look at this to understand how to interpret a Phylogenetic Tree"
Thanks to in-depth testing of the R2 haplogroup, a branch structure is starting to emerge. This is the structure as of early 2011 based on newly identified SNP mutations. Haplogroup L has not been well studied. Its distribution in our region is intriguing to say the least. There are pockets of L in the Hamshen, the Pontic region, Lebanese Maronites, Israeli Druze and Syrians living on the eastern boarder with Turkey/Iraq. The branch structure of this haplogroup has not been well determined. Most people in our region belong to L2 and its branches. Armenians so far belong to the L2* and L2a branches. According to Gareth Henson: "L2 is notably a middle eastern and mediterranean branch of L, it is almost totally absent from India and Pakistan (except possibly amongst the Parsi who are originally from Iran, they have a distinctive L haplotype which I have not seen SNP tested but it looks closest to L2)." The following MAP was built on published data. Take it with a grain of salt because differences in modal haplotype of L between Anatolia and India suggests independent expansions from two distinct founder populations. We need different maps for the different branches. Let us hope new academic papers are published soon on this fascinating haplogroup. Gareth Henson: "I think both T and L originated in the Iraq/Iran region... The branches of L all went in different directions (L1 southeast, L2 west and L3 northeast)." Haplogroup Q, possibly the youngest of the 20 Y-DNA haplogroups, originated with SNP mutation M242+ in a man who likely lived in Siberia approximately 15,000 to 20,000 years before present. Too little is known about the Q1a3 (M346+) and Q1b1a (L245+) subclades at this stage. One of the theories as to the origin of Q1b is discussed here. New SNPs have recently been discovered. Maybe they will give structure to this branch. 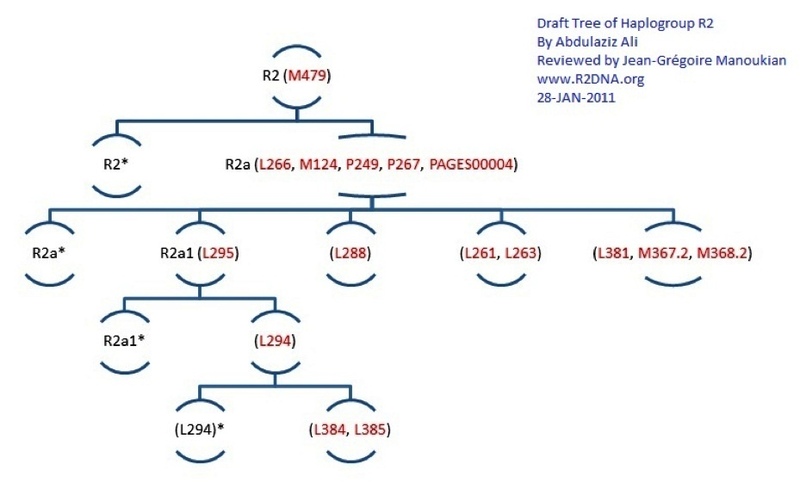 See draft TREE of haplogroup Q. Two of the Armenian DNA Project members belongs to the very rare Haplogroup F, mother of all non-African haplogroups except for C, D, and E as can be seen in this simple diagram and this more complex TREE. A man from the C,F haplogroup was the common ancestor of all people who migrated outside of Africa until recent times. The defining mutation occurred 31-55,000 years ago in north east Africa and is still most common in Africa today in Ethiopia and Sudan. The following MAP shows how the daughter branches of "F" spread out from the Near East. Haplogroup F is the direct ancestor of haplogroups G, H, I, J, and K, and through K the ancestor of haplogroups L, M, N, O, P, Q, R, S and T (formerly K2). Thus approximately 90% of the male population of the world carry the mutations that define haplogroup F, though an individual is not considered to be in haplogroup F unless he also tests negative for mutations that define the haplogoups descended from F.
According to Ken Nordtvedt: "An F man is certainly an ancestral node to IJK nodeman and later IJ nodeman and later I nodeman. We have never found a single haplotype of IJK, IJ, or I* And a very long time goes by between the IJK nodeman and the earliest clades of I that we see --- perhaps the I2* and I2a1 M26+ clades. We're talking several tens of thousands of years." The Armenian Fs belong to the F3 branch because they tested positive (derived) for P96 and M282. One of them also has six newly discovered SNP mutations: L279, L280, L281, L284, L285, L286. The slew of new SNPs from Family Tree DNA's "Walk Through the Y" sequencing are just a testament to the long elapsed time between our Armenian "F" and previously sequenced men. 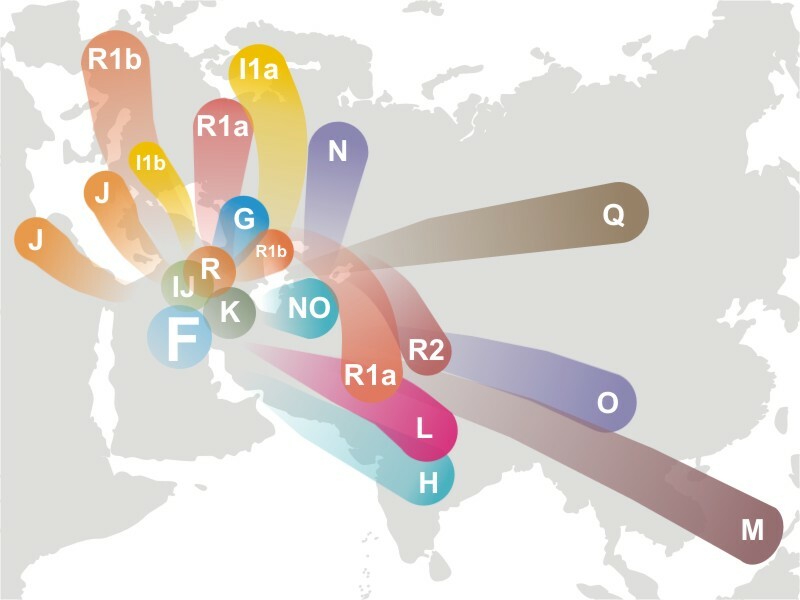 The relatively young haplogroup R1a (M17+) is the most frequent Y-chromosome haplogroup among populations representing a wide variety of language groups, such as Slavic, Indo-Iranian, Dravidian, Turkic and Finno-Ugric, which are found in a wide geographic area extending from South Asia to Central East Europe and South Siberia. The peak is in Poland at 35%. It's age and distribution are shown in this MAP and this MAP. Haplogroup R1a has been found in 5% of Armenians and at higher concentrations in these Caucasus groups: 27.5% of Karachays & Balkars, 20% of Abazas, 12.5% of Kumyks, Kabardians & Cherkessians, 10% of Adyghes, Nogays, Karanogays & Abkhazes. Neither the Armenians nor the Caucasian groups seem to be of Slavic origin as evidenced by this MAP of subclade R1a1a7 (M458+). We have to look to the East (Iran, Afghanistan, Pakistan and India) or to the North (Russian plains) for explanations of the presence of R1a's in our region. Look here for the mutations which define your mtDNA haplogroup and branch. mtDNA Haplogroup U originated in a woman who lived around 55,000 years ago. Her descendants gave birth to several different subgroups, some of which exhibit specific geographic homelands. The old age of this haplogroup has led to a wide distribution of the descendant subgroups that harbor specific European, northern African, Indian, Arab, northern Caucasus and Near East clades. The U1 branch seems to appear mostly in the Middle East, however low frequency results appear scattered throughout Europe particularly in the Mediterranean. U1a is found from India to Europe, but is extremely rare among the northern and Atlantic fringes of Europe. U1b has a similar spread but is rarer than U1a. 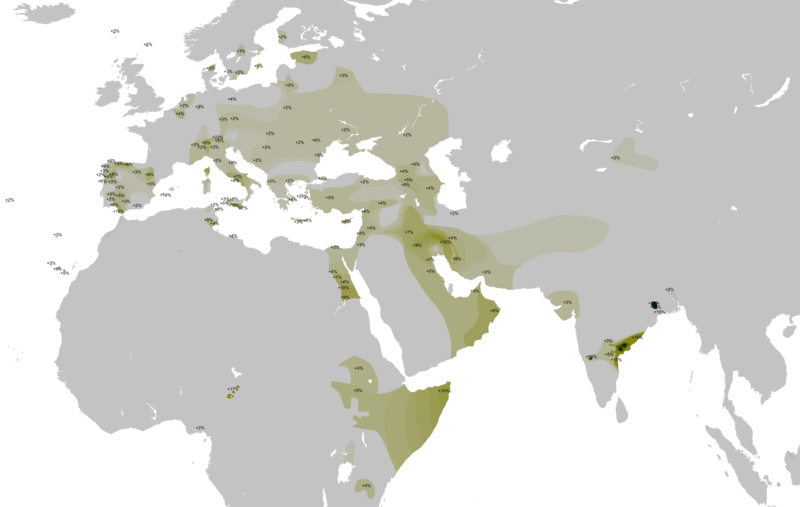 Haplogroup U2 is most common in South Asia but also found in low frequency in Central and West Asia, as well as in Europe as U2e. This haplogroup has been found in the remains of a 30,000-year-old hunter-gatherer in South European Russia. The U3 branch appears to be fairly ancient (probably at least 35,000 to 45,000 years old). It is found at the highest frequencies in countries surrounding the Black Sea, especially in Bulgaria and the Caucasus and in some countries of the Near East such as Jordan and Syria as can be seen in this MAP. It is found at very low levels throughout Europe (about 1% of the population), the Near East (about 2.5% of the population), and Central Asia (1%). U3 is present at high levels among Lithuanian, Polish and Spanish Roma populations (36-56%). The U4 branch has its origin in the Upper Palaeolithic, dating to approximately 25,000 years ago. It is widely distributed in Europe, and has been implicated in the expansion of modern humans into Europe occurring before the Last Glacial Maximum. It is found at low frequencies throughout Europe, North America and Asia. It is particularly prevalent in Finland and Russia. The U5 branch pre-dates the expansion of agriculture in Europe. Its age is estimated at 50,000 years but could be as old as 60,500 years. Haplogroup U5 and its subclades U5a and U5b form the highest population concentrations in the far north, in Sami, Finns, and Estonians, but it is spread widely at lower levels throughout Europe. This distribution, and the age of the haplogroup, indicate individuals from this haplogroup were part of the initial expansion tracking the retreat of ice sheets from Europe ~10,000 years ago. Haplogroup U5 is found also in small frequencies and at much lower diversity in the Near East and parts of Africa, suggesting back-migration of people from northern Europe to the south. U5a is six times more prevalent than U5b in our regions where it reaches 6.3% of the population of the Caucasus and 3.3% of the population of Iran. 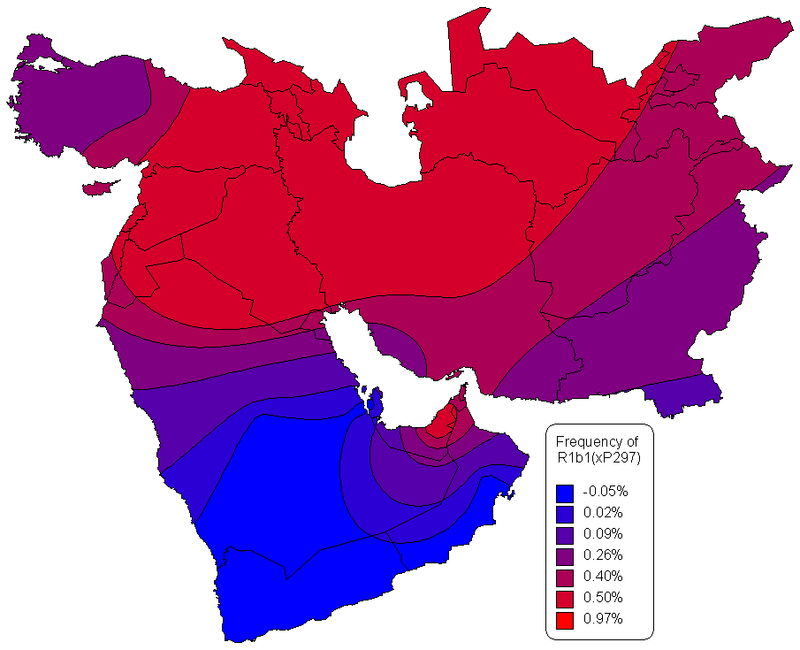 Many European populations lack Haplogroup U7, but its frequency climbs over 4% in the Near East and up to 5% in Pakistan, reaching nearly 10% level in Iranians. In India, haplogroup U7 frequency peaks at over 12% in Gujarat, the westernmost state of India, while for the whole of India its frequency stays around 2%. Expansion times and haplotype diversities for the Indian and Near and Middle Eastern U7 mtDNAs are strikingly similar. The possible homeland of this haplogroup spans Indian Gujarat and Iran because from there its frequency declines steeply both to the east and to the west. If the origin were in Iran rather than in India, then its equally high frequency as well as diversity in Gujarat favors a scenario whereby U7 has been introduced to the coastal western India either very early, or by multiple founders. Here is the most recent TREE for this haplogroup. And here is a complete list of the latest U SNP mutations. Armenian members of the project belong to all six of the above mentioned subhaplogroups. mtDNA Haplogroup H probably evolved in West Asia ~30,000 years ago and then arrived in Europe ~20-25,000 years ago, spreading rapidly to the southwest of the continent. It is now the most common mtDNA haplogroup in Europe representing about one half of the population. This haplogroup is also common in North Africa and the Middle East. The H13 subhaplogroup is particularly prevalent in the Caucasus. The H2 and H8 subhaplogroups are somewhat common in the Caucasus and Eastern Europe. H5 may have evolved in West Asia where it is most frequent and diverse in the Caucasus. Here is the most recent TREE for this haplogroup. A key paper for haplogroup H in our region was published in 2006 by Roostalu: Origin and Expansion of Haplogroup H, the Dominant Human Mitochondrial DNA Lineage in West Eurasia: The Near Eastern and Caucasian Perspective. Although Armenian members of this important haplogroup haven't been thoroughly tested, those who have belong to the four above mentioned subhaplogroups. mtDNA Haplogroup W is found at low levels from Europe through the Near East and the Caucasus all the way to India and Thailand. Analysis of the pockets of concentration suggest this haplogroup was spread by Indo-Iranian speakers who are originally thought to have lived in the steppes of Central Russia. Here is the most recent TREE for this haplogroup. This website covers mtDNA haplogroup W. One page and its associated map is of interest to all W's. Another page and its associated map concern the W6 branch. mtDNA Haplogroup T is thought to have originated in Mesopotamia and/or the Fertile Crescent (modern Syria and Turkey) more than 45,000 years ago. The major sub-lineages of Haplogroup T entered Europe around the time of the Neolithic 10,000 years ago. Once in Europe, these sub-lineages underwent a dramatic expansion associated with the arrival of agriculture. Haplogroup T has a very wide distribution, and is present as far east as the Indus Valley bordering India and Pakistan and as far south as the Arabian peninsula. It includes slightly fewer than 10% of modern Europeans. Here is the most recent TREE for this haplogroup. 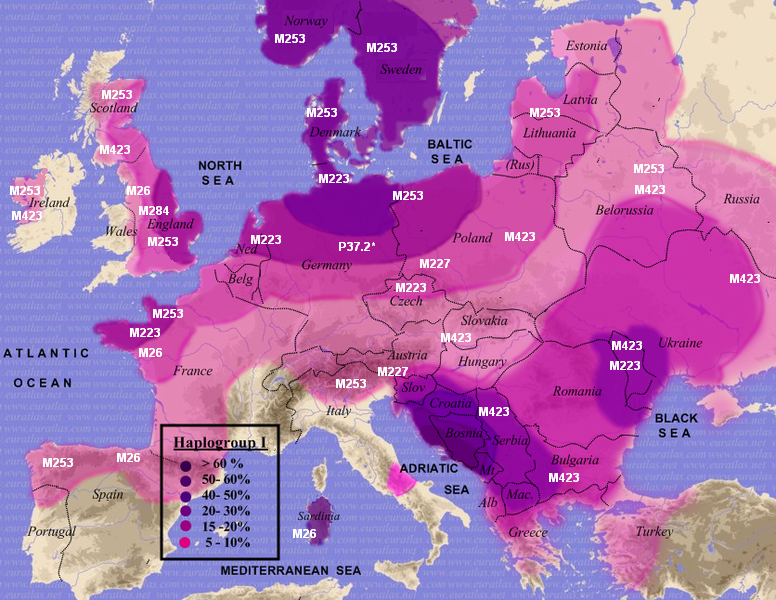 mtDNA Haplogroup I is found at low levels in Europe, the Middle East and South Asia. It is believed to have arisen somewhere in Eurasia ~30,000 years before present and to have been one of the first haplogroups to move into Europe. Here is the most recent TREE for this haplogroup. mtDNA Haplogroup HV is a west Eurasian haplogroup found throughout the Middle East, including Iran, Anatolia and the Caucasus. Much earlier, around 30,000 years ago, some members of HV moved north across the Caucasus Mountains and west across Anatolia, their lineages being carried into Europe for the first time by the Cro-Magnon. Their arrival in Europe heralded the end of the era of the Neandertals, a hominid species that inhabited Europe and parts of western Asia from about 230,000 to 29,000 years ago. Better communication skills, weapons, and resourcefulness probably enabled them to outcompete Neandertals for scarce resources. Importantly, some descendants of HV had already broken off and formed their own group, haplogroup H, and continued the push into Western Europe. Here is the most recent TREE for this haplogroup. mtDNA Haplogroup X diverged originally from haplogroup N, and subsequently further diverged about 20,000 to 30,000 years ago to give two sub-groups, X1 and X2. It accounts for about 2% of the population of Europe, the Near East and North Africa. Sub-group X1 is much less numerous, and restricted to North and East Africa, and also the Near East. Sub-group X2 appears to have undergone extensive population expansion and dispersal around or soon after the last glacial maximum, about 21,000 years ago. It is more strongly present in the Near East, the Caucasus and Mediterranean Europe and is somewhat less strongly present in the rest of Europe. Particularly high concentrations appear in Georgia (8%) and amongst the Israeli Druze community (26%); the last presumably due to a founder effect. Here is the most recent TREE for this haplogroup. mtDNA Haplogroup J: Around 45,000 years before present, a mutation took place in the DNA of a woman who lived in the Near East or the Caucasus. Further mutations took place in the J line which can be identified as J1a1 (27,000 yrs ago), J2a (19,000 yrs ago), J2b2 (16,000 years ago), J2b3 (5,800 yrs ago), etc. 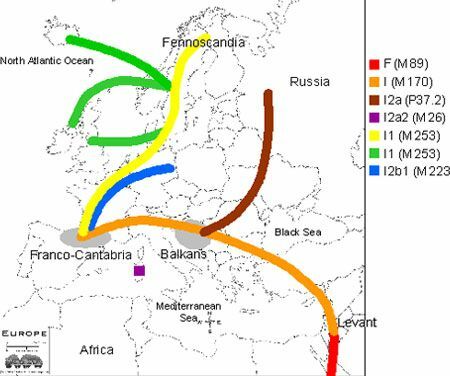 Haplogroup J (along with ‘T’) is associated with the spread of farming and herding in Europe during the Neolithic Era (8,000-10,000 yrs ago). All other West Eurasian-origin groups (H, V, U, K, W, I, X) were previously given to hunting and gathering. Average frequency of J Haplogroup as a whole is highest in the Near East (12%) followed by Europe (11%), Caucasus (8%) and North Africa (6%). Of the two main sub-groups, J1 takes up four-fifths of the total and is spread on the continent while J2 is more localised around the Mediterranean, Greece, Italy/Sardinia and Spain. Here is the most recent TREE for this haplogroup. mtDNA Haplogroups N1b & N1c are particularly found in the Near East, Middle East, Turkey and the Caucasus. Here is the most recent TREE for this haplogroup. Prof. Malliya Gounder Palanichamy has been studying hg N1. He recently published a paper on N1a in which one can find this TREE . He plans to publish papers on N1b and N1c soon. mtDNA Haplogroup K is relatively young. It first appeared around 16,000 years ago. It now represents a sizeable fraction of the Western Eurasian genetic pool. In Europe, it is particularly common around the Alps and the British Isles. It is found in lesser frequency in North Africa, the Middle East and South Asia. There are higher than average concentrations in Ashkenazi Jews and in the Druze. Here is the most recent TREE for this haplogroup. mtDNA Haplogroup V is believed to have originated approximately 12,000 years ago, possibly in Iberia according to published information. It derives from the Haplogroup HV0a, which also gave rise to Haplogroup H. Except for rare, isolated occurrences, V is virtually absent in the southern Balkans, Turkey, the Caucasus, and the Near East. Attested migrations from the north(west) into these regions in historic times are certainly sufficient to explain these few “erratics.” I have a feeling the preceding explanation may not hold as we now know of three Armenian V's. Only time will tell where this group originated. 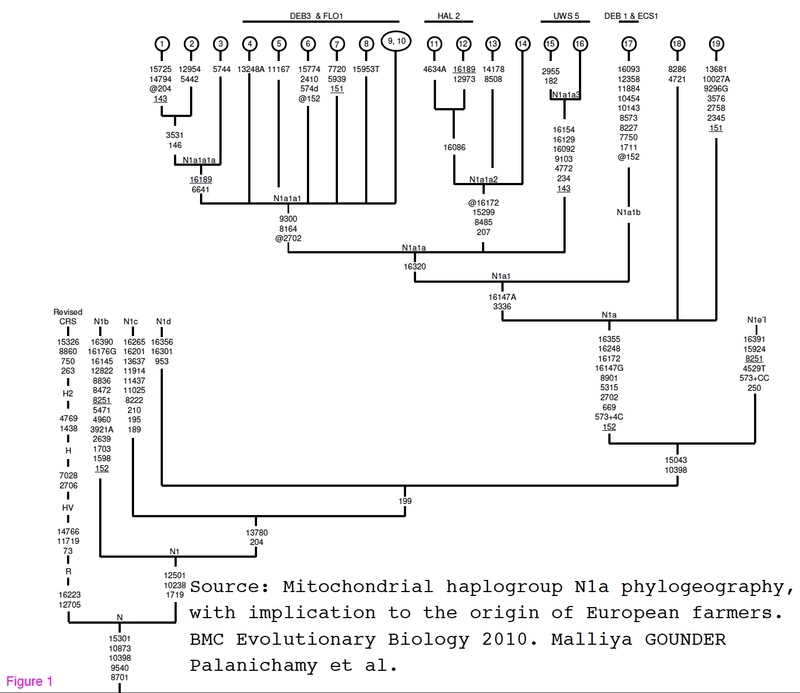 A key paper for haplogroup V i was published in 2001 by Torroni et al. It is now quite dated: A Signal, from Human mtDNA, of Postglacial Recolonization in Europe Here is the most recent TREE for this haplogroup. In human mitochondrial genetics, mtDNA Haplogroup R is a very extended mitochondrial DNA (mtDNA) haplogroup and is the most common macro-haplogroup in West Eurasia. Haplogroup R is a descendant of macro-haplogroup N. Among its descendant haplogroups are B, U (and thus K), F, R0 (and thus HV, H, and V), and the ancestral haplogroup of J and T. Haplogroup R has wide diversity and antiquity among varied ethnic status and different linguistic families in South Asia. The Armenian R sequence is so novel, a new category called R3 will be created for it. Here is the most recent TREE for this haplogroup. mtDNA Haplogroup F is centered in Asia and appears in eastern China and Japan. It is not found in the Americas. 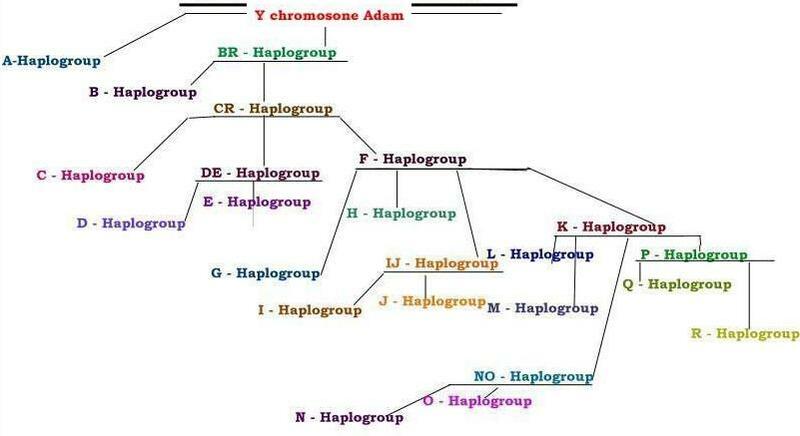 F1b1 samples have been found in Armenia, Turkey, Mazandaran, the Caucasus, Georgia, Kurdistan and Croatia, It is a descendant haplogroup of Haplogroup R. It Here is the most recent TREE . mtDNA Haplogroup M1 is the only variant of M found in Africa. 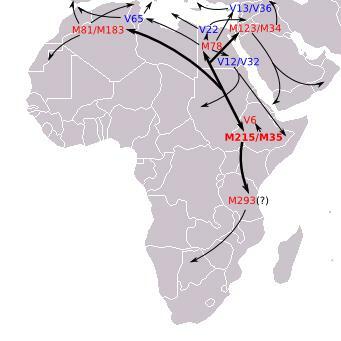 The limited distribution of haplogroup M in Africa and its widespread presence outside Africa, suggests that this lineage emerged very close to the time of the Out of Africa migration, either shortly before or shortly after the exit from Africa. M1 is relatively common in the Mediterranean, peaking in Iberia. It also enjoys a well-established presence in the Middle East, from the South of the Arabian Peninsula to Anatolia and from the Levant to Iran. In addition, M1 haplotypes have occasionally been observed in the Caucasus and the Trans Caucasus. Here is the most recent TREE for this haplogroup. If you are comparing your mtDNA sequence to another sequence from the same haplogroup branch, please note the following: a difference of one mutation in HVR1 or HVR2 should be taken as 400 years, and a difference of one mutation in the CR coding area should be taken as 1,600 years.